One of the most common questions I get about the dogs is what type of grooming tools I use on them. In the seven years that I’ve been blogging, I have never devoted a whole post to this topic and the only reason I can think of for not doing that is that, in my opinion, grooming tools are ultimately based on personal preference. There’s a standard that you go by but it ultimately comes down to what works best for you and what is in your budget. 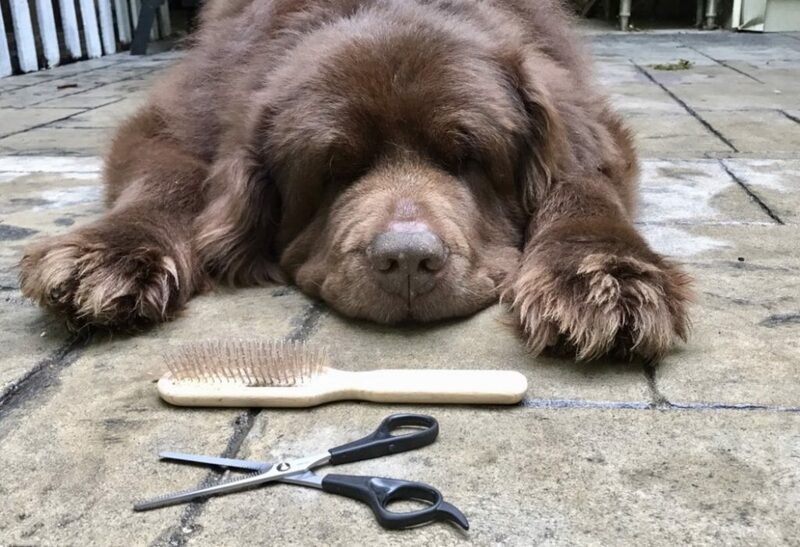 However, since Newfoundlands require daily grooming and some people who get a Newfie are never given a guide as to what grooming tools are best, I put together a list of the most common tools that are used by those of us who have been using them for years on our own dogs. This is my everyday brush and by far my favorite. I use the Chris Christensen 20mm oblong pin brush. A pin brush is great for everyday grooming. Used for removing tangles from longer coats. The pins move through the hair removing tangles while the ends of the brush gather dead hair. Pin brushes come in a ton of different sizes and varieties. It’s personal preference which one you choose but try to stay away from the ones with the little plastic balls on the top. Those will just fall off and I’ve had issues with them snagging the coat. I’m personally not a fan of the longer pins which is why I use a 20mm BUT a lot of people will use something longer. An undercoat rake is used to remove undercoat and tangles from double coated breeds like the Newfoundland and is often used when a dog is blowing coat. The long teeth (pins/tines) get deep down into the coat and grab out loose fur and mats. They come in a wide range of styles with different teeth lengths for different coats and textures. The rakes that come with different lengths and double rows are best for removing undercoat. A single length, single row is best for everyday use. Used for de-matting and removing dead hair from the undercoat. The wire pins move through the coat to untangle hair while the bent ends gather dead hair. Slicker brushes come in all different sizes and can be found with soft or firm pins. I don’t use a slicker brush often. Actually, I can’t even find mine right now. Easily removes dead hair and undercoat. Normally used to de-bulk heavy coated areas like the chest, and pants. It’s actually a stripper and has blades. It should be used sparingly and with care.I don’t use it often but when I do I use for Sherman’s chest and his pants area where he is very thick. While sizes vary and people use a variety of sizes the most common among Newfie people seems to be 18″ blade double wide and that is the one I have BUT some people may use a different size. These tools are used to help cut up mats so that you can comb them easier. They come in several varieties. I don’t use it often but I have one with a single blade. Use caution when using a mat splitter. They are sharp and can leave holes. I use a fine tooth comb for the ears. I probably don’t have to, but I do. My favorite comb. This is great for line combing and to remove debris from the coat. It has two sides: one with pins that are closer together for fine hair and a side where the pins are farther apart for coarse hair. Again, this comes in a variety of sizes. I use the medium/coarse. They can be used to thin out the hair on the ears, paws, chest, pants and other areas of the dog’s body. These can range in price, shape, and sizes. The best thing you can find that is comfortable to use. The 40 tooth shear is a good option. The fewer teeth, the choppier the cut. If you’re going to invest in any scissor this would be the one that I would put my money towards. You can also get these at beauty supply stores. 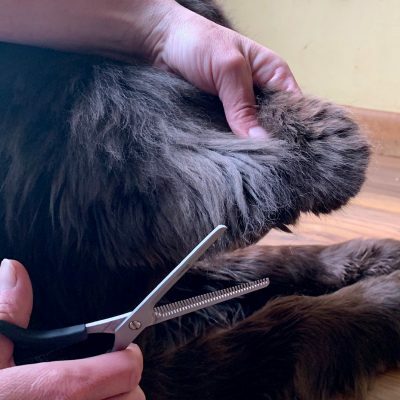 Not everyone is comfortable using straight shears but they can be great for trimming flyaway hairs and paws. Shears can get pricey. I’ve bought a few from local hair supply stores and saved a few bucks but the blades dull fast. Use these carefully! Straight shears can easily cut the skin and will leave a choppy look if you are using them on the body. I’ve made this mistake plenty of times, just ask Sherman. If you get a pair find one that feels comfortable to use. There’s nothing worse than getting your thumb stuck in the thumb hole. These are often used to give shape to ears, paws, and legs. I hardly ever use mine. Even when we showed I didn’t use curved shears much. I prefer the straight shears and a clean line. Clippers can be used in places of straight shears. Mostly on the paws or for a short belly trim in the warmer months. I’m in need of a new one but I had an Oster that lasted me years. They come in a variety of different styles. The blade size will depend on what you’re trying to accomplish. 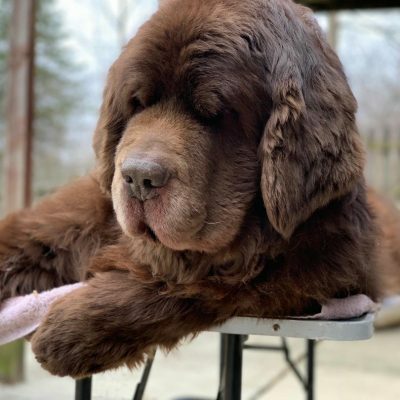 If you plan on taking on the task of being your Newfs sole groomer, a grooming table is a great investment from the start. Not only will it save your back but it will also help keep a Newfie in a single place. My recommendation is to introduce the grooming table to your Newf when they are a puppy. We did not do this with Sherman and we had a heck of a time with him getting used to it. With Leroy, he was on the table the day he came home and loved it ever since. There are several different grooming tables available. Some come at a set height while others are adjustable. Since I’m short, we cut a few inches off of ours. Our table is 48 inches long and both the boys fit perfectly on it. I must note that a dog should never be left alone on a grooming table. Serious injuries can result if they fall off. A sleeping Newfie on a grooming table should be monitored also, even when you are standing right there. Sherman has almost rolled off more than once. A velocity dog dryer is an important tool if you will be bathing your Newf yourself or if you have a Newf that likes to swim. Drying a wet dog will help cut down on hot spots because a high-velocity dryer gets down to the skin. It can also be used on a dry coat to blow out loose hair and dander. Do you know how much dander a Newf can accumulate? A ton! Dryers can be costly and there’s a ton of options available. I still use the one we got 20 years ago. A cool dryer with different airflow settings is nice to have. Some of the more popular dryers among Newfie owners are the K9 high-velocity dog dryers and Metro Air Force dryers. I have a Metro Force, it’s lasted me years. NEVER use a regular human blow dryer on a Newf. It gets too hot and it will never dry their coat. 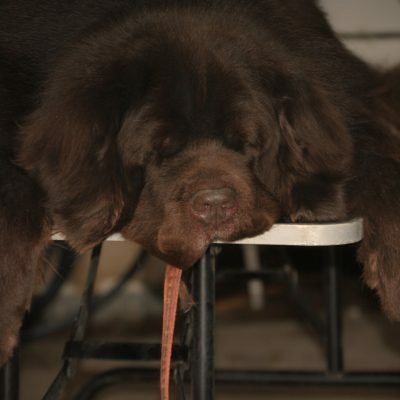 Note: It can take several hours to completely dry a Newfoundland so set aside time for that. Check out our post How To Choose a Dog Dryer For Your Newfoundland. A grooming spray makes for an easier brush and comb out. Dry hair tends to break. I don’t use a grooming spray every single time but if it’s a full out grooming session I do. With so many available it’s hard to recommend one. Pick a smell that you like or one that works with your dog’s coat condition. Currently, I’m using Earthbath Vanilla Almond but I’ve used at least a dozen different ones over the years. When we showed I used Crown Royale and Ice on Ice Detangler Spray. A tackle box is a great place to store all your small grooming tools! Scissors and combs on the top and brushes and spray on the bottom! 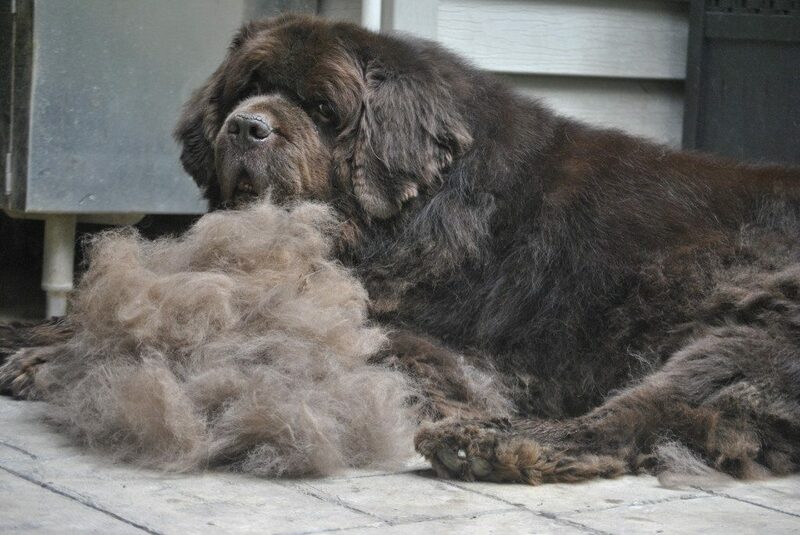 If you decide to take on all your Newfoundland’s grooming care it can be a great bonding experience for you both. I feel it’s very therapeutic. Starting them young is the best way to go. I hope this list is helpful to those of you who have been asking about grooming tools over the years! Shop our Amazon store for all your dog grooming needs! « Are Cicadas Toxic To Dogs? Great article. We were just having a discussion about this on a Sheltie site. Thanks! I bet that was a great discussion. I had a Collie growing up and the grooming for him was involved. I’m assuming it would be close to the same with the Sheltie’s? They are! They have more grooming supplies than I do ! Your tools look a lot like mine! Do they boys require a lot of grooming Cathy? I’ve always wondered that! Wow!! This is awesome! So helpful! Thanks Tara! 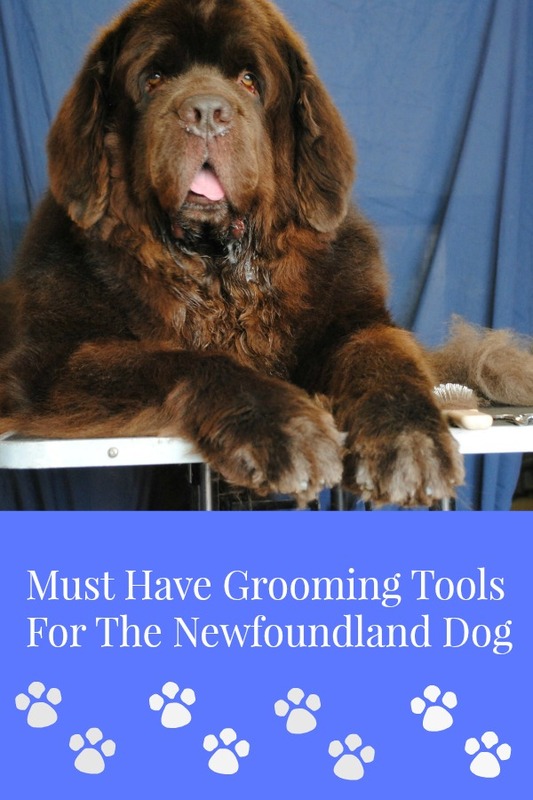 I do hope that it’s helpful for some people who’ve been considering taking on the task of grooming their Newfoundland themselves! Wow!! Awesome job!! Thank you for the advice!! Thanks Tara! I hope it was helpful! Wow! I use a brush, some small shears ( for pitch), and a comb for the undercoat, especially on Rodrigo. Whenever I’m brushing our dogs I think of breeds with a lot of hair and I laugh. Zoey has the most brush out in Spring, Rodrigo has the last (and the longest hair). I don’t use ALL of these everyday, mostly just the brush and comb but sometimes we have to bring out the tackle box and make a day out of it! Our Beagle only had a comb and brush. Lol! That is a lot of grooming tools. How long does it take you to groom one dog? You don’t realize how much goes in to keeping these beautiful dogs groomed!! It sounds like so much work to groom one of your dogs. I’m curious if you’ve ever tried a Furminator on one of them? It’s a great tool on the right coat. Interesting post.Thanks for the info. What dog shampoo and other products would you use on a newf? Such a great and helful post though. I like it quite much and have most of them in my room lol. Thanks for sharing a helful post. Some of these products sound like what I use for my curly hair! Haha! I agree, grooming your dog can be a bonding experience. I think they know that is a way to show them that you love them.